As we previously announced, Toy Story Land finally opened on June 30th at Walt Disney World. The new, immersive land allows guests to experience what it is like to be a toy in Andy’s backyard. The new land opened within Disney’s Hollywood Studios and the attractions are seeing extremely long lines. Not only are there new attractions, shopping and dining options, but there is also new entertainment. One of the entertainment offerings is the Green Army Drum Corps. They roam through the land pulling guests into the fun that is happening. The Green Army Drum Corps complete their march through Andy’s backyard several times a day. They play fun drum sets and sequences to captivate the audiences. This is definitely high energy entertainment that will have you dancing in the streets. Sarge and his Green Army Patrol will also be on the lookout for new recruits and pull them into an interactive boot camp. 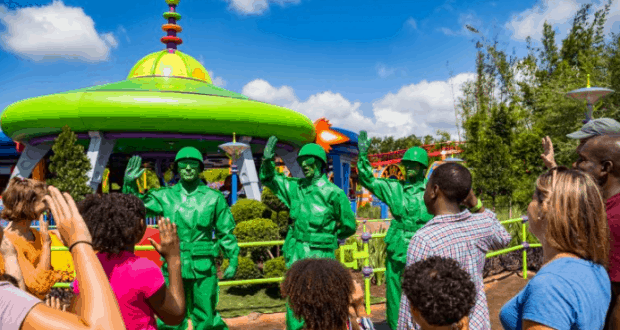 You might even get chosen for a gamy of “Sarge Says,” where you complete a variety of tasks that use giant Pixar balls, over-sized crayons and more to let you see if you have what it takes to become one of the cadets. Who out there has been lucky enough to visit Toy Story Land already?